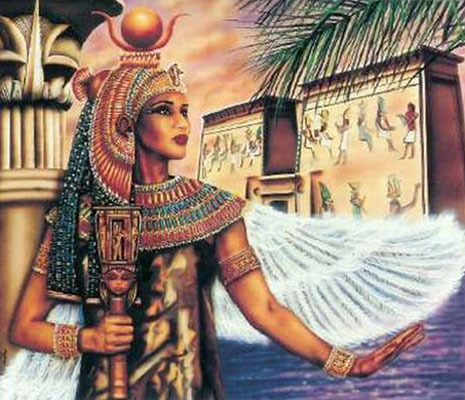 The Queen of the Nile has flooded my banks. of the waters of Isis. I am a green palm tree in Her oasis. Her Spirit is my shade. an other water baby into the arms of love. while I rocked afloat in Her womb. with the tickle touch of divine fingertips. a living sea scroll of remembrance. my mane matted with desire's sweet dew. I have no name, but am a pet in Her passion. that drip from Her hands as love letters. and mark my territory upon them. and pats me down with a lover's kiss. I can only wade here and tremble. upon a shore of ruin. I am a ruin waiting to fall. A door unhinged and a lock burst asunder. and baptize Jesus in my soul. growling love into her ripe belly. I am every sweetheart's upheaval. by a pulse from the fingertip of Love. who has cast love from them. with the tresses of her graceful hair. and returning, a prodigal heart of Her greening. If the wind howls I become a wolf. melting into a gulf stream. I open a rose garden in the hearts of children. my den is hidden from every hunter but love. all this new wine down to be your drunk. This 'I' I speak of. This estuary of acceptance. It has no form to hold to. the deserts and the valleys. It has no name on any map. by letting it waters be any level. It is just a flowing. up as green corn again. to fertilize the earth with spring shoots. These words have no one to speak them. They arise like fireflies in a warm wind. and return to Her womb as Her children. flash across a mind-sky and disappear, to be you. All text on this page is Copyright February 24, 2002 by Eric J. Ashford.